Use 1 capsule once a day during a meal containing fats. Due to the slight sedative effect it is recommended to take the supplement in the evening immediately before learning, in combination with stimulants. To achieve effective results in improving the memory use for a minimum of 4-6 weeks. 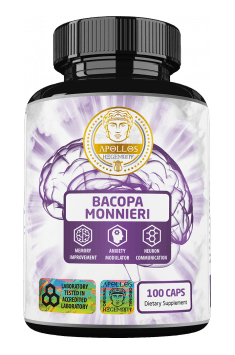 Bacopa Monnieri is a natural and safe supplement which can be used for the improvement in mood and cognitive functions as well as for anxiety and stress reduction. To achieve maximum results, especially those concerning memorising, Bacopa should be applied for 4–6 weeks, as such dosing has the highest effectiveness proven by the research. However, in case of stress reduction, the effects can be observed even by an ad hoc application. It is recommended to take a one month break after 2–3 months of supplementation, to prevent the weakening of effects, and then repeat the whole therapy ones again. The use of Bacopa with a source of fats allows for better absorption of active components and improved product action. The use of the product with a meal additionally reduces the risk of intestinal ailments which can be observed by the fasting application. In case of sedation caused by the supplement, we can combine it with a stimulant, for example with caffeine contained in coffee. One capsule a day seems to be enough in most cases. Folic acid in capsules. It supports the synthesis of red blood cells and the functioning of the nervous system. Patented form of Quatrefolic® folic acid. It promotes the proper functions of the nervous system. Vitamin B8 has antidepressant and anxiolytic properties and prevents mood swings. Source of folinic acid. Constitutes versatile support for the functioning of the organism. Testosterone booster in capsules containing zinc, magnesium and vitamin B6. It supports anabolism and detoxification. Bacopa monnieri (bacopa cordata) - a plant of the family Scropfulariacea rich in a number of active ingredients, such as bacosides (A and B), monnierasides, hersaponin, alkaloids (herpestine, brahmin), mannitol, phytosterols and flavonoids. It has stimulant properties that affect memory and concentration. It is an antioxidant and has a beneficial effect on the biological renewal of an organism. Accelerates protein synthesis and has adaptogenic effect. Willingly used by students during preparation for end-of-term examinations, in sports supplementation is recommended in the period of intensified training, during sporting competitions (rarely before an short-term exercise). Part of the creatine stacks, no-boosters and herbal preparations for increase of concentration and mood.